Another SMW has come and gone, and I'm another $180 poorer for it. 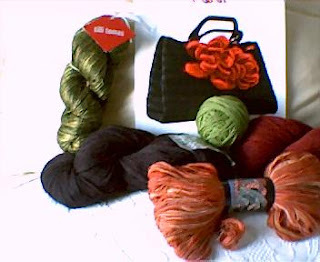 Only $120 of that went for yarn; the rest was for overpriced meals and cab fare. I couldn't afford to take classes the whole weekend as I'd like to do, but I did learn a lot. My Friday afternoon class was on creativity with Sally Melville. Not only is she an amazing designer, she's a wonderfully generous teacher. Basically, she shared all her tips and secrets with us. It was an extremely engaging class that I would recommend for anyone whose interested in creative pursuits, not just knitting. My all-day Saturday class was on vintage socks with Nancy Bush. I took an Estonian lace class with her 2 years ago, so I already knew what a great teacher she is. We did a little sample sock to illustrate various techniques that were published in the Weldon's knitting books in 19th-century England. I was by far the fastest knitter in the class, so she used my sock for a demonstration of grafting at the end of the class. No, I'm not a teacher's pet, just Speedy Gonzalez. The fashion show was excellent this year. Many of the garments are from the fall issue of Knitter's magazine. There were also several lace pieces from Jane Sowerby's "Victorian Lace Today." I came away with lots of ideas and inspiration. The yarn market was the main attraction, of course. I decided to go for quality, rather than quantity, this year. It's all in the picture below. The little green ball is Reynold's Sea Wool that I bought for the sock class; I have lots of sock yarn at home, but it's all variegated, and you need plain yarn for a class so you can see what you're doing. I also bought some Cascade 220 in dark brown and red to make a striped Noni carpet bag (the pattern is propped up behind the yarn). 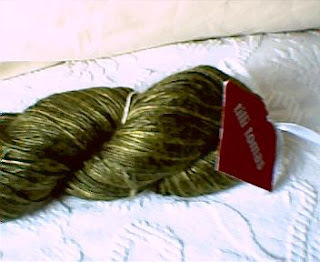 Finally, I bought some olive green silk yarn from Tilli Tomas (on the left) and some hand-dyed cashmere laceweight yarn from Just Our Yarns (at the bottom right). Who knows how long it'll be before I actually get started knitting this stuff? I have several other projects on the needles right now. But it's nice to know that it'll be in my knitting basket waiting for me. I spent more than my share at SMW. I really enjoyed it this year. I am looking forward to it being in Schaumburg next year. I didn't take classes but the different yarn booths are what were my downfall. 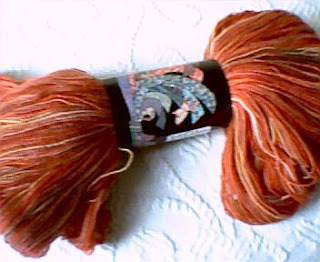 I got some great deals on some wonderful yarn. I'm not too thrilled about the change of venue because it means renting a car to get out there from the city. At least at Rosemont I could take the blue line and then walk over. The Metra station in Schaumburg is almost 10 miles from the new venue. The yarn market is just amazing. I always urge my friends to go out there just for the market, even if they can't afford to take classes. Wow did you have some great people to teach you! The Tilly Thomas is gorgeous!